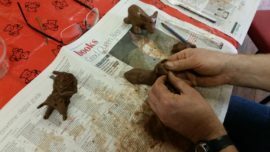 Well we’ve had a lovely couple of days of people dropping in to make small sheep sculptures for our installation. You’ve been a lovely bunch, and all of the sheep sculptures are beautifully unique, and the growing flock is looking great. We’re waiting a few days for the sculptures to dry out and then they’ll migrate outside to their final grazing site. 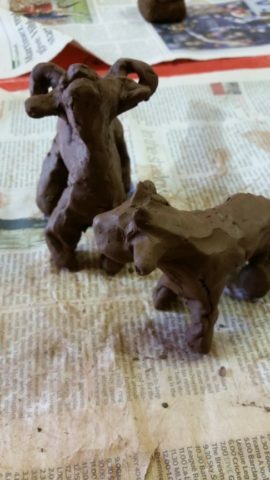 Commondale is built on clay. In the surrounding villages, many of the older houses are stone built. Commondale, however, is built primarily from hard, bright red Commondale brick. 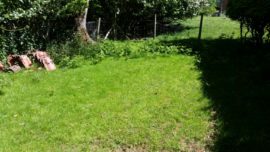 The few exceptions are the older farmsteads predating the brickworks, and the houses built for managers of the brickworks, which are built from local stone. 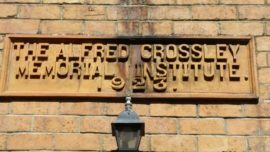 The Alfred Crossley Memorial Institute, inside which we are creating the clay sculptures, and in the grounds of which we are installing our piece, has stood since 1923. It was built in honour of Alfred Crossley, who died in 1919. The Crossley family owned the brickworks for many years. 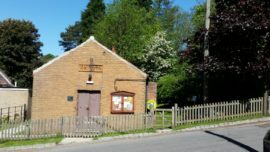 It is Commondale’s village hall. And proudly evaded health and safety concerns, boasting the last real, open fire of all the local village halls. The bricks of this building are more of an ochre shade, rather than the more commonly seen bright red. Some of the brickworkers cottages (ours included) are also built from these softer, yellower bricks. 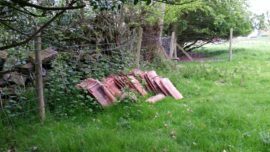 It is thought that these bricks were still likely to have been made in Commondale but that they were fired at the edge of the kiln, where temperatures were lower, or were perhaps made before the newer kilns, which had more uniform temperatures throughout, we’re installed. 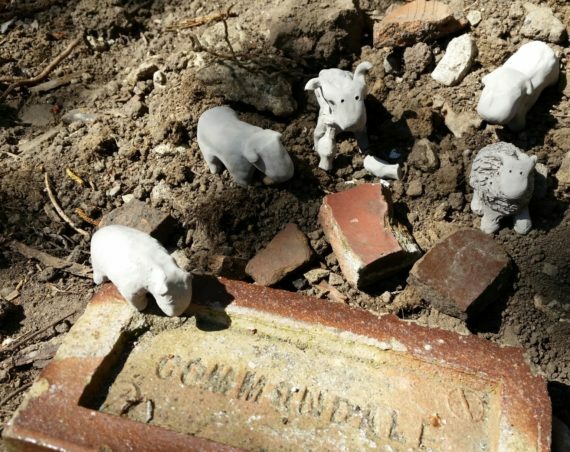 Whatever the reason, there are different bricks throughout Commondale. We decided to use terracotta clay for our project, rather than an ochre shade, as the red bricks are more distinctively ‘Commondale’. 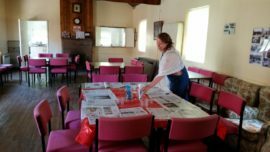 Well, we’ve been preparing the hall for the participatory part of the project. It’s all ready for people to come along and get creating the piece with us. 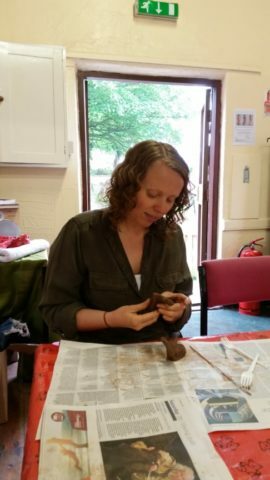 On Monday 29 and Tuesday 30 May, and Saturday 3 June between 11am and 4pm locals and other visitors can drop into Commondale village hall, called the Albert Crossley Memorial Centre to be a part of the piece. 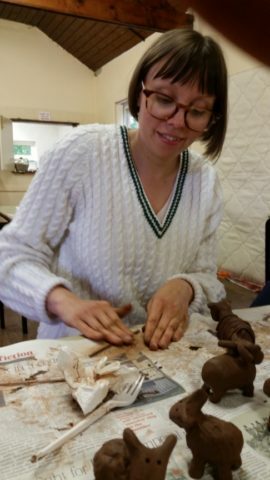 Come and make three terracotta clay sheep – one to take away with you, and two to stay as part of the flock. 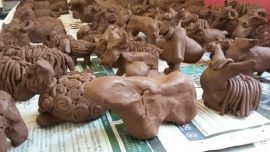 The collection of all these handmade sheep will form an installation outside the hall, in the public space, they will remain to be viewed as the piece changes and weathers. Thirty sheep to every person? There are 129 people living in Commondale (2011 Census) and many more sheep. There was a statistic floating around (which I’ve been unable to hunt down) that there are thirty sheep to every person in the Moors, which would make over 70,000 sheep. 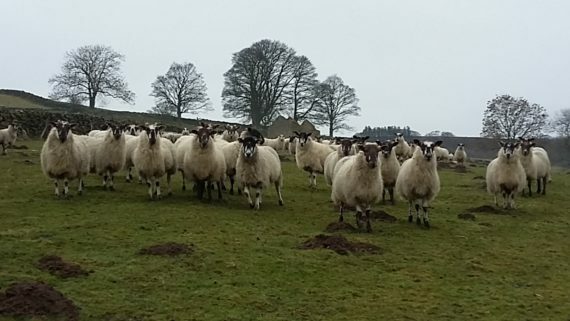 Undoubtedly, sheep are a part of everyday life in Commondale, for both farmers and non-farming residents alike. Sheep roam up and down the ‘main’ roads (hardly the M25). 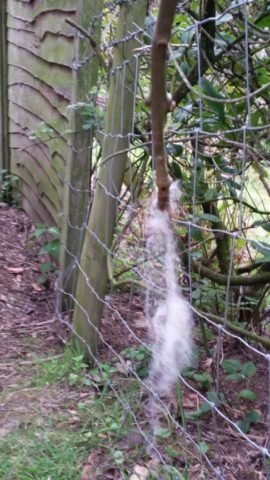 So a small group of scampering lambs and their patient mums sauntering past the front gate is more or less an everyday sight at this time of year. 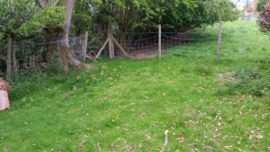 Residents have to keep their gates shut otherwise the sheep will come in and destroy the garden. They are partial to daffodils so there’ll never be a Commondale in Bloom (!) but I’d personally go for sheep over daffs outside my front gate any day. Certainly makes a change from the wheelie bin fires you’d find outside our old house in Sheffield. Whilst they might might move for me and my small fox red terrier when we’re out on a walk, sheep are not at all bothered about cars. And you can guarantee if you’re running late somewhere, they’ll be a small flock blocking you’re exit at some point. But what a beautiful diversion, eh?